The Paraset was a small, low-power, thermionic valve CW morse code-only radio transmitter-receiver supplied to the resistance groups in France, Belgium and the Netherlands during World War II. The Paraset was one of the first successful miniaturized radio sets for Britain's Special Operations Executive which conducted espionage and other activities behind German lines during World War II. 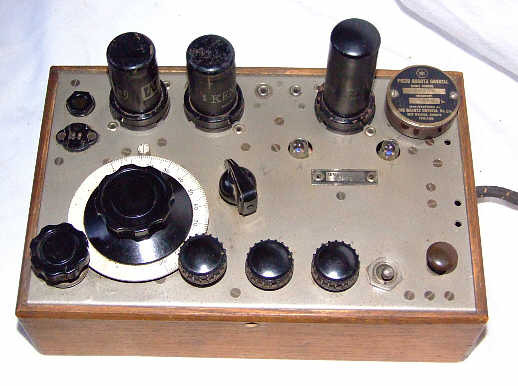 The set, known as the Whaddon Mark VII, was used for clandestine radio communication primarily in Norway and Europe, developed at the Royal Signals Special Communications Unit workshops at Little Horwood and the workshops of Whaddon Hall, Buckinghamshire in the early stages of World War II. The equipment is known as the “Paraset” because it was dropped by parachute for field agents. A number of amateur radio operators build and operate replicas of the Paraset. Receiver coverage: 3.0 to 7.6 MHz, one band. Transmitter coverage: slightly more than 3.0 to 7.6 MHz, two bands, selectable. Power output: 4 to 5 watts. ^ "Transceiver Mk VII Paraset, British". UK Imperial War Museum. Retrieved 5 July 2016. ^ Peter R. Jensen (1 September 2013). Wireless at War. Rosenberg Publishing. pp. 228–. ISBN 978-1-922013-84-2. ^ G4GDR; G3EFY. "The Paraset Club". theparasetclub.co.uk. The Paraset Club. Archived from the original on 2008. Retrieved 5 July 2016. ^ Arnold, Richard. "The First QRP* Ops". ARRL. American Radio Relay League, Inc. Archived from the original on 2009. Retrieved 5 July 2016. ^ Gordon, Kenneth G. "The "Paraset" Suitcase Spy Transceiver of WWII". Glowbugs. W7EKB. Archived from the original on 2006. Retrieved 5 July 2016. This page was last edited on 2 July 2018, at 09:37 (UTC).